We build on the parsers from part 2 of this series to enhance and extend their capability. In particular, we extend the concept of modular grammars to construct chains of parsers which define a multi-stage transformation pipeline. The parsers forming these chain are enhanced to match and transform tree-structures, rather than being limited to simple sequences. Since the protocol used by all of the parsers is the same, we can easily substitute specialized implementations optimized for use in particular contexts. Frequently used patterns are worth considering for optimization based on specialization. The previous implementations of rep_ptrn_beh and many_ptrn_beh are defined by expansion into more primitive patterns. By doing the expansion ourselves, and then refactoring, we arrive at more compact and performant implementations. This pattern matches zero-to-many occurances of a pattern. The accumulated result is a NIL-terminated list of matches. Notice how this implementation avoids binding and passing useless information. For example, this pattern can’t fail, so the original fail continuation is not bound, only the ok continuation is bound. Unused message values are matched with the _ wildcard and irrelevant values are sent as ? undefined. The accumlated result list is built explicitly by the ok’, ok” and fail’ continuation actors. The recursive reference to SELF is captured in the repeat variable, referenced from the ok’ continuation actor. This pattern matches one-or-more occurances of a pattern. The accumulated result is a NIL-terminated list of matches. This implementation follows the same general strategy as rep_ptrn_beh, and also creates a repeat actor with that behavior to handle the repeating tail of the pattern once the first occurance is matched. The fail continuation is used only if the first occurance of the pattern fails to match. A transform expression applies a function to the accumulated value without changing the environment in a semantic value. The implementation reads more clearly than the explanation. The xform_expr creates a semantic action which applies a transformation function func to the accumulator acc. The xform_ptrn_beh expands to an expr_ptrn_beh which applies the semantic action created by xform_expr. We will use the xform_ptrn_beh to convert tuples of matched characters into primitive symbols and numbers. The built-in functions tuple_to_symbol and tuple_to_number perform the actual conversion for us. With this machinery in place, we define a grammar for parsing languages in the LISP/Scheme family (based on ). # "(CAR ( LIST 0 1)\t)"
The entire input stream is matched successfully. 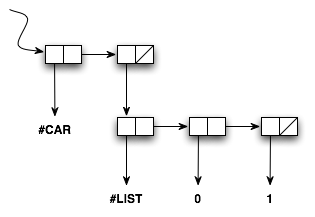 The accumulator of the resulting semantic value contains the expected list structure, as shown in Figure 1. So far, our parsers have all processed streams (sequences) of symbols. The accumulated semantic value has often been a parse-tree (sequence of sequences). We can extend the applications of our parser machinery by chaining parsers together so that the output of one parser becomes the input to the next. In order to support this use, we must be able to match the tree structures (nested sequences) generated by previous parsers. The tuple_ptrn_beh will match these nested sequences. But first, we examine one more sequence-generating pattern. This pattern matches a sequence of literal symbols. The accumulated result is the sequence of symbols matched. It is defined by recursive expansion into instances of seq_ptrn_beh, one_ptrn_beh and zero_ptrn_beh, with an expr_ptrn_beh to capture the accumulated match. We can demonstrate this pattern by defining a grammar for the keywords SEND, CREATE and BECOME. The input matches the SEND keyword. The accumulator value is a tuple of the matched characters. This pattern is the key to processing trees rather than flat sequences. A tuple pattern treats a single input token as a nested sequence and matches it against a given pattern. If the pattern matches the entire nested sequence, then the tuple pattern matches, consuming the input token. Otherwise, the tuple pattern fails, consuming no input. If the current input in contains a token, then that token is used to produce a new tuple_stream_beh and start_beh initiates matching the pattern ptrn. If the pattern matches, we ensure that there is no left-over input in the nested stream before consuming the original input token and indicating success. A token stream is used to chain parsers together so that the output of one parser becomes the input of another. A source stream is repeatedly matched against a top-level pattern. The result of each match becomes a token produced by the token stream, or stream_end if there are no more matches. This token stream can be provided as the input stream to another parser, establishing a link in the chain of parser transformations. Our stream protocol is pull-based. A #read request on the stream initiates the processing necessary to produce the next token, or stream_end to indicate that no more input is available. Our parser protocol expects to be given an input which is either stream_end or a pair consisting of a token and the next input position. The token_stream_beh and token_input_beh provide an adapter between the expectations of the stream protocol and the parser protocol. We now have quite an extensive toolkit of parsers and semantic actions. By chaining together a series of modular parsers, we can create powerful flexible transformation pipelines. The components in the pipeline can be reused and recombined to implement a wide variety of processes, from lexical analysis and parse-tree generation, to structural optimization and code generation. One key to this flexibility is the ability to match tree-structured, rather than simply sequential, input. This allows us to use the same tools for multiple stages in the recognition and transformation process. This entry was posted in Uncategorized and tagged actor, composition, grammar, pattern-matching, PEG, protocol, sequence, streams. Bookmark the permalink. Post a comment or leave a trackback: Trackback URL.